Interactive Classrooms | Bailey Communications Inc.
How Are Interactive Classrooms Being Used? Can Sound Be Added To Interactive Classrooms? What Features Come With The Epson BrightLink? 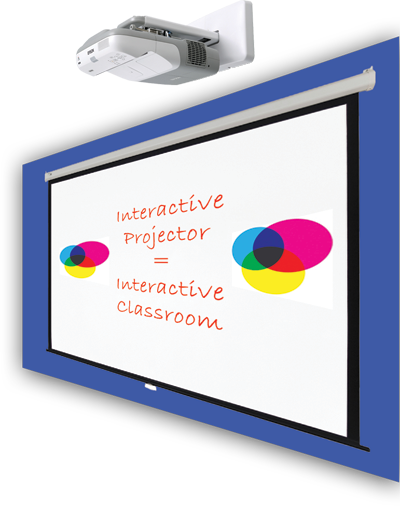 Bailey Communications is a leader in the installation and training of Interactive Classrooms. Our team precisely engineers each Interactive Classroom to meet the needs of educators, students, employers, and anyone in need of knowledge transfer, covering the entire spectrum of teaching and training technology. We carefully design, manage, and construct your custom Interactive Classroom, addressing your current needs with future growth potential. We ensure your plan appropriately meets organizational demands and remains within budget. What is an Interactive Classroom? An Interactive Classroom employs technology in teaching or training. It can include a variety of different mediums but the most popular is the Whiteboard. Much like the traditional whiteboard, an Interactive Whiteboard is different. It acts as an input device for a computer and is coupled with a projector. The computer detects the information that is put on the whiteboard. When combined with a projected image, the whiteboard then becomes a large, interactive computer display that aids in classroom teaching, employee training, or transfer of information between departments in any organization. All of the information recorded on the whiteboard can be used to generate printable documents. Join our Growing List of satisfied Epson BrightLink Projector Owners! "We need technology in every classroom and in every student and teacher's hand, because it is the pen and paper of our time, and it is the lens through which we experience much of our world." Yes! Bailey Communications uses Bose/Shure Audio Amplification Systems, designed specifically to meet the needs of each individual classroom. Bailey Communications offers a no obligation test period for our Epson BrightLink Interactive Whiteboards. That's right! We will bring a mobile Interactive Whiteboard to your location, install it, and allow you to see the difference, onsite, free of charge. "In a 2000 study commissioned by the Software and Information Industry Association, Sivin-Kachala and Bialo (2000) reviewed 311 research studies on the effectiveness of technology on student achievement. Their findings revealed positive and consistent patterns when students were engaged in technology-rich environments, including significant gains and achievement in all subject areas, increased achievement in preschool through high school for both regular and special needs students, and improved attitudes toward learning and increased self-esteem." "With support from Bailey Communications team of professionals, an Interactive Classroom can improve test scores in all subject areas as well as improve self-esteem in students. It will improve internal communications and transfer necessary knowledge of processes and procedures efficiently and effectively. It can generate sales on lagging product lines by increasing knowledge within your sales staff. It will be an integral part of Total Quality Management (TQM) within your business."